Excess carbohydrate or protein in the diet is converted to triglyceride and stored in the lipid droplets of adipocytes. Excess dietary fat needs no conversion other than lipolysis and re-esterification. People who wish to lose weight while maintaining their fat-free mass are, biochemically speaking, attempting to metabolise the triglycerides stored in their adipocytes. The chemical formula for an average triglyceride molecule can be deduced from fatty acid composition studies. In 1960, Hirsch and colleagues published data that yield an “average fatty acid” with the formula C17.4H33.1O2.1 This 50 year old result is in remarkable agreement with more recent data.2 Three “average fatty acids” esterified to the glycerol backbone (+3C, +6H) give an “average triglyceride” with the formula C54.8H104.4O6. The three most common fatty acids stored in human adipose tissues are oleate (C18H34O2), palmitate (C16H32O2), and linoleate (C18H32O2),1 2 which all esterify to form C55H104O6. Stoichiometry shows that complete oxidation of 10 kg of human fat requires 29 kg of inhaled oxygen producing 28 kg of CO2 and 11 kg of H2O. This tells us the metabolic fate of fat but remains silent about the proportions of the mass stored in those 10 kg of fat that depart as carbon dioxide or water during weight loss. To calculate these values, we traced every atom’s pathway out of the body. The carbon and hydrogen atoms obviously depart as CO2 and H2O, respectively. The fate of a triglyceride molecule’s six oxygen atoms is a conundrum solved in 1949 by Lifson and colleagues.3 They used labelled heavy oxygen (O18) to show that the oxygen atoms of body water and respiratory carbon dioxide are rapidly exchanged through the formation of carbonic acid (H2CO3). A triglyceride’s six oxygen atoms will therefore be shared by CO2 and H2O in the same 2:1 ratio in which oxygen exists in each substance. In other words, four will be exhaled and two will form water. 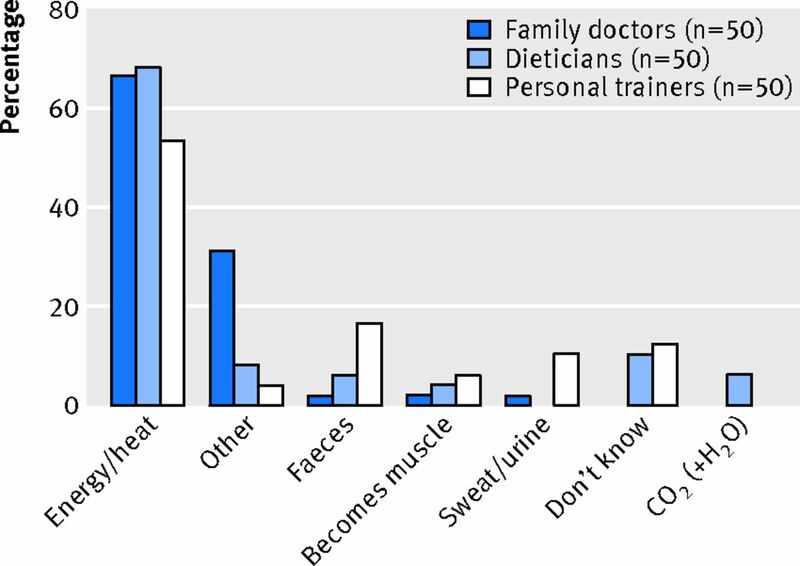 These results show that the lungs are the primary excretory organ for weight loss (fig 2⇓). The water formed may be excreted in the urine, faeces, sweat, breath, tears, or other bodily fluids. 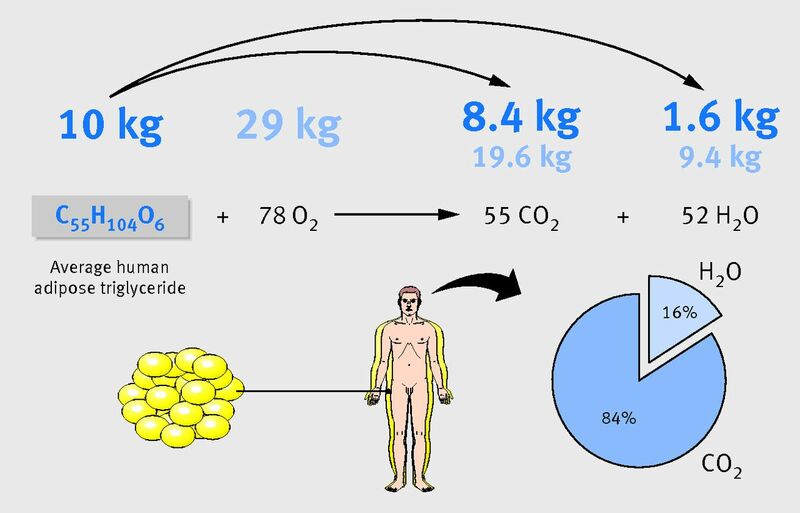 At rest, an average 70 kg person consuming a mixed diet (respiratory quotient 0.8) exhales about 200 ml of CO2 in 12 breaths per minute.4 Each of those breaths therefore excretes 33 mg of CO2, of which 8.9 mg is carbon. In a day spent asleep, at rest, and performing light activities that double the resting metabolic rate, each for 8 hours, this person exhales 0.74 kg of CO2 so that 203 g of carbon are lost from the body. For comparison, 500 g of sucrose (C12H22O11) provides 8400 kJ (2000 kcal) and contains 210 g of carbon. Replacing one hour of rest with exercise that raises the metabolic rate to seven times that of resting by, for example, jogging, removes an additional 39 g of carbon from the body, raising the total by about 20% to 240 g. For comparison, a single 100 g muffin represents about 20% of an average person’s total daily energy requirement. Physical activity as a weight loss strategy is, therefore, easily foiled by relatively small quantities of excess food. Hirsch J, Farquhar JW, Ahrens EH, Jr, Peterson ML, Stoffel W. Studies of adipose tissue in man. A microtechnic for sampling and analysis. Am J Clin Nutr1960;8:499-511. Lifson N, Gordon GB, Visscher MB, Nier AO. The fate of utilized molecular oxygen and the source of the oxygen of respiratory carbon dioxide, studied with the aid of heavy oxygen. J Biol Chem1949;180:803-11. Ainsworth BE, Haskell WL, Herrmann SD, Meckes N, Bassett DR, Jr, Tudor-Locke C, et al. 2011 Compendium of physical activities: a second update of codes and MET values. Med Sci Sports Exerc2011;43:1575-81. You are going to email the following When somebody loses weight, where does the fat go?